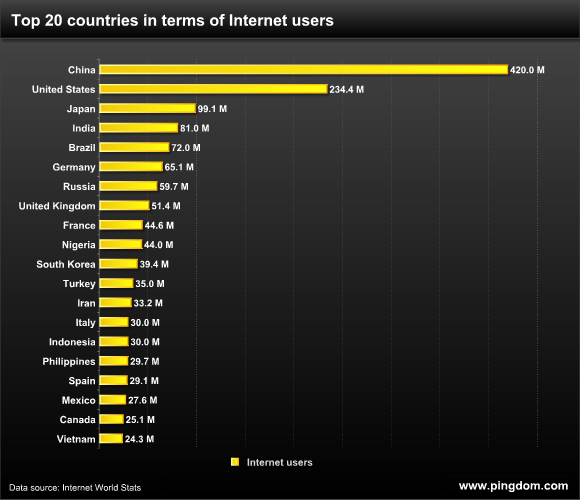 According to Pingdom, a Swedish company whose “focus lies on covering the uptime monitoring needs of 90% of the companies in the world,” there are a total of 1.8 billion Internet users in the world (i.e., about 27% of the human race). Vietnam ranks 20th just behind Canada. 24.3 million Vietnamese are connected to the Internet, which is about 27% of the population. Below is a list of the top 10 sites in Vietnam, according to Alexa.com. The 1 month rank is calculated using a combination of average daily visitors and pageviews over the past month. The site with the highest combination of visitors and pageviews is ranked #1. If you take a look at the world rankings of the media websites on this list, you’ll know why the advertising rates are skyrocketing. The types of sites represented also give you an idea of how connected young people here are spending some of their time (social networking, videos, file sharing, etc. ).